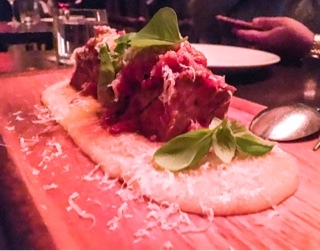 Buca, an Italian restaurant tucked in the end of an alley down King West, has been racking up accolades as being a top Toronto restaurant. Having visited when it first opened in 2010, I recall having a well-executed plate of pasta yet wasn’t blown away. “Maybe I didn’t order the right dish?” I keep thinking as praise for Buca continues. With that in mind, I ventured back with friends who love to share in tow. 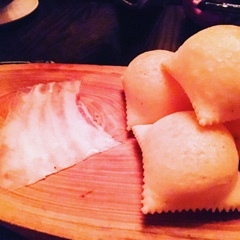 In a ravenous carb eating mood, the gnocco fritto ($7) sounded enticing: pillows of Tuscan spiced dough, which you’re advised to slit open and dump a translucent slice of lardo into. As the warmth from the dumpling envelopes the lardo, the cured pork fat begins to melt combining a light slickness to the slightly sweet crispy and chewy dough. 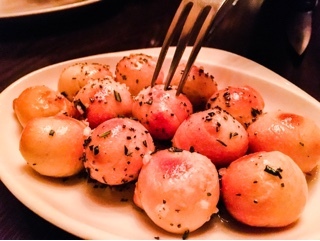 Be careful when approaching the nodini ($6) - hot bread knots sitting in a pool of olive oil, rosemary and garlic. Images of soft chewy garlic bread comes to mind, but when you actually try to stab one of these suckers you realize the crust is crispy and hard … one false step and the nodini could easily end up at the neighbouring table. Eating with your hands is recommended so that you can enjoy this aromatic dish while it’s hot. They’re good but anything slathered in garlic oil generally is. The last appetizer consisted of the cavolfiori carbonara ($10), well roasted cauliflower florets whose smokiness melds into a rich cheesy carbonara sauce. The raw egg yolk is mixed into the hot clay dish tableside releasing an intoxicating smell. 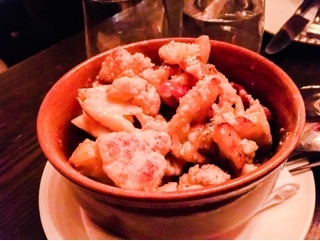 For a person who’s sick of all the cauliflower gracing menus, Buca’s version was delicious and worth ordering again. 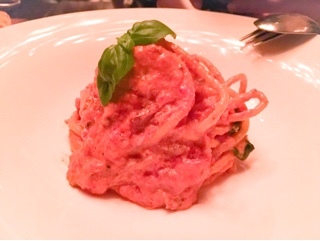 Coming back to try Buca’s famed bigoli ($21) for a second time, I’ve finally narrowed down why it threw me off. Certainly, there’s nothing wrong with the thick chewy strands of freshly made duck egg pasta. Nor was the duck offal ragu repulsive. But, what’s unsettling is the combination of Venetian spices and mascarpone that makes the sauce taste like butter chicken. It’s tasty, but not exactly Italian? 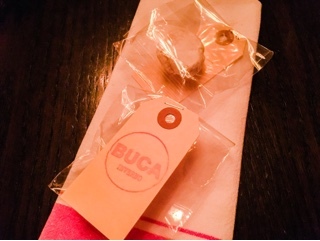 In a city filled with great authentic pizza places, Buca can still compete amongst the fray. 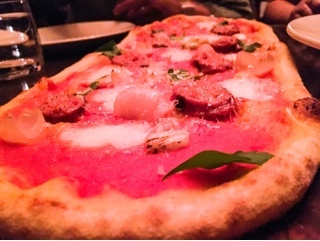 Their soppressata ($24) had a lovely evenly cooked golden crust and the crisp bottom allowed slices to withstand holding plump Calabrese sausage and plenty of sauce. Although the pizza had heat, it wasn’t overly spicy and was balanced with sweet cipollini onions. In interviews, Chef Gentile stresses the importance of using quality ingredients and to keep it simple. For me, the brassato ($32) was an excellent example of such a dish. Served off the bone, the beef rib was well braised and moist without relying on fatty bits. Moreover, I appreciated that it wasn’t overly salted, rather served with a delicate tomato sauce so the beef’s flavouring still stood out. 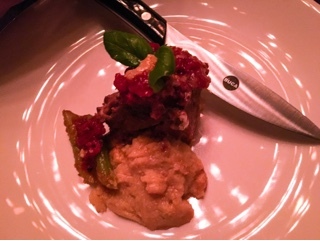 The stone-milled polenta on the bottom had the texture of grits, the rustic-vibe complimenting the heavier beef perfectly. Although I love tiramisu, I’m glad Buca is expanding our palettes; the migliaccio ($14) is so different from all desserts gracing menus across Toronto! And after a heavy meal, the fluffy lemon ricotta cake such a great way to finish off. 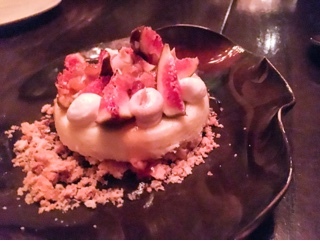 On top of the light sponge cake were tons of juicy figs, dollops of chestnut cream and crushed crunchy cookies. The Amaro Lucano, a digestive liqueur, added a mild herbal bitterness to keep the cake from becoming overly sweet. As a parting gift, we each received an amaretti morbidi, a chewy almond cookie that I enjoyed with tea the following morning. I’ll admit it, even after a second more substantial meal, I don’t get the hype over Buca. Don’t get me wrong, the food is delicious and I appreciate the quality ingredients, non-fussy presentations and selections that rise above meatballs and marinara. I want to drink the Koolaid that Chef Gentile’s serving (have you seen the man’s photos? ), but the overall experience just isn’t as mind-blowing as the accolades make the restaurant out to be.